Restylane® and Perlane® are made of hyaluronic acid, the same viscous substance that lubricates our joints! Both products are FDA approved for the treatment of moderate to severe facial wrinkles and folds. This material is not obtained from donors; rather, it is synthesized in pure form in the lab. Because it is a thick substance that occurs naturally in the human body, it is more comfortable, lasts longer, and feels more natural than other injectable fillers such as collagen. Restylane is the most used cosmetic dermal filler, and has been used in more than 1.4 million treatments in the US. For more information about Restylane and Perlane, or to schedule a consult with Dr. Hurst or Dr. Tate, call our offices in Nacogdoches at Nacogdoches Oral Surgery Office Phone Number 936-569-1111 or Lufkin at Lufkin Oral Surgery Office Phone Number 936-632-4444; you may also use our online Appointment Request form. 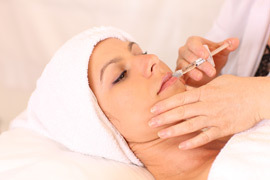 What are the differences between Botox® and Restylane®?